I am proud to present Sensory Like You – the very first book by SPD adults for SPD kids! It was written by my ever-lovely sensory friend Rachel S. Schneider of Coming to My Senses. And of course, yours truly has done the illustrations, (if you couldn’t already tell by the cover). Yea, that’s me waving on the front, and that’s Rachel on the swing. We are really something. “This lovely book fills a big gap. 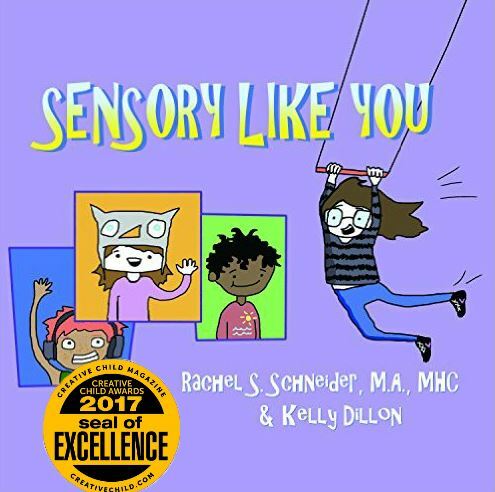 Reassuring, wise, and witty, “Sensory Like You” would be as great a gift for a young child as it would be for a grandparent, teacher, or other adult who maybe doesn’t quite “get it” yet.” -Carol Kranowitz, M.A., author of The Out-Of-Sync Child series.